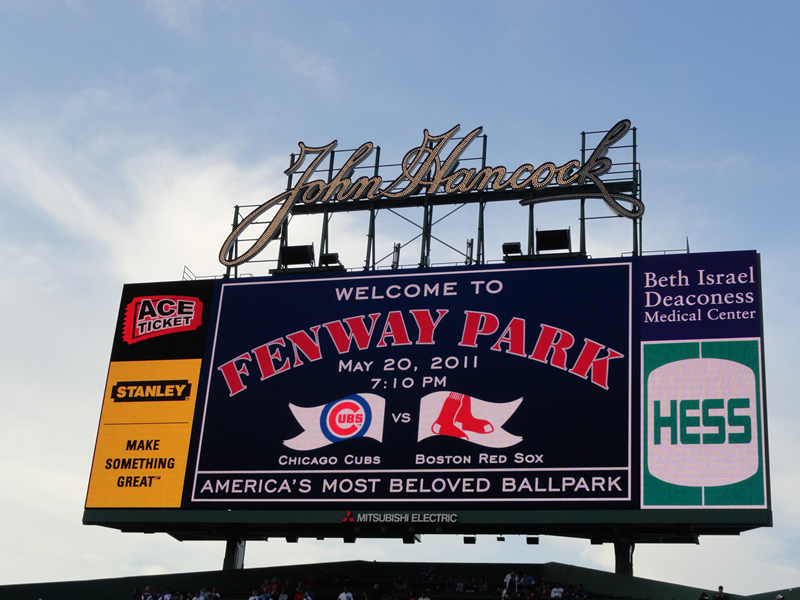 This was the first time the Chicago Cubs played at Fenway Park since the 1918 World Series. I was super excited. Cubs fans and Red Sox fans get along really well. 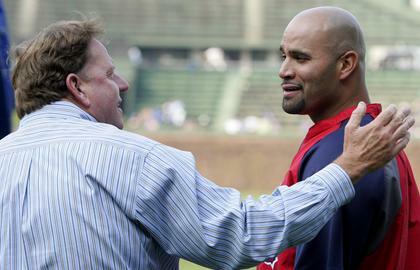 Up until the BoSox won the World Series in 2004, the Cubs and Red Sox fans had shared decades of misery. I find it often to be the case that Cubs fans will cheer for the Red Sox and Red Sox fans will cheer for the Cubs, because their games rarely affect one another. I found Fenway Park to be a very welcoming place. There were many Cubs fans there, but there was no real trash-talking until people had had their third or fourth $8 beer in the fifth inning. The atmosphere around Fenway is reminiscent of Wrigleyville, in that everyone for 5 blocks is excited about the ballgame. Everyone was friendly and in a great mood (except for the heretics standing on the corner proclaiming that Jesus was coming back May 21st). Dad and I got to the park early, and we went inside as soon as they opened the gates. I was very excited to discover that we had made it in time to see the Cubs’ batting practice. I was able to get right up next to the field in my attempt to get autographs, however, there were roped off sections and none of the players came near me. I did get to meet Jim Hendry (General Manager of the Cubs). I got my picture taken with him on my phone (which I lost in Philadelphia…bummer). I abstained from asking him about signing Pujols next year, no need to jinx that just yet. After batting practice, I went and found my dad and our seats. We were seated 14 rows back in right field, behind the Cubs’ bullpen. I enjoyed being behind the bullpen, because I got to see the different pitchers warming up. The first pitch was thrown out by former Red Sox and Cubs pitcher Dennis Eckersley to the former Red Sox catcher Carlton Fisk. That was really cool to see both of them. The Cubs hit pretty well (especially Jeff Baker who went 4-5 with 2 runs), but they couldn’t hit with guys on base. Also they committed 4 errors (3 in one inning, yikes). Despite the awful play of my Cubbies, I enjoyed the game. I especially enjoyed the singing of Sweet Caroline in the 8th inning, which is a pretty sweet tradition at Fenway Park. Although I have no idea why they sing “Sweet Caroline” every game at Fenway. Do any of you? I also enjoyed the four, mildly drunk fans three rows in front of me singing the Notre Dame fight song to Jeff Samardzija while he warmed up. They also made many Bo Jackson and Deion Sanders comments towards him. 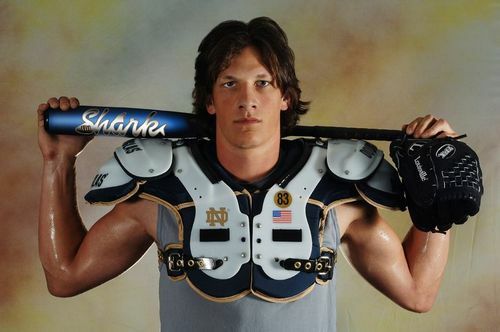 I cheer for my Cubbies faithfully, but I honestly think Jeff should have stuck with football. This game – although a blowout of my beloved Cubbies – was a great start to this trip of a lifetime. I had a blast, and I look forward to telling you about the rest of the trip too. You’ll never guess what my company gets to do on July 1st. They have Wrigley rooftop seats for the Cubs vs Sox game! You may be jealous of me now…except I can’t go. I’ll be in Nebraska that day. That would be quite an experience. But, I’m sure you’ll enjoy ole Nebraska. I just want to make sure I understand this… you’re turning down rooftop Wrigley seats for …. NEBRASKA?!?!?!?! You are a an alien lifeform here to take us over aren’t you? I understand your sentiment captain. I’d feel the same way if I didn’t know that she had many loved ones in Nebraska. Plus, she might not want to experience White Sox fans in person, they’re vicious. Fenway’s former music director, Amy Tobey, started picking songs to play over the PA back in the 90’s. She kept choosing “Sweet Caroline” any time between the 7th through the 9th when the Sox were ahead. People responded to it, and the new ownership officially made it a tradition for the 8th in 2002. The beloved Pedro Martinez, back when he was bringing it, would dance to it as well. This probably helped matters. Sweet. Thanks for the backstory Dub.